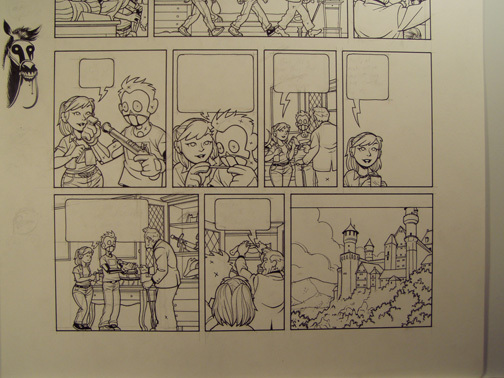 Now I’ve gone in and finished the backgrounds for the last few panels. It really makes the page look a lot better, doesn’t it? Next I’ve just got to erase the pencils. Once I’ve erased the pencils, I’m pretty much done. Sometimes I just scan straight from this. 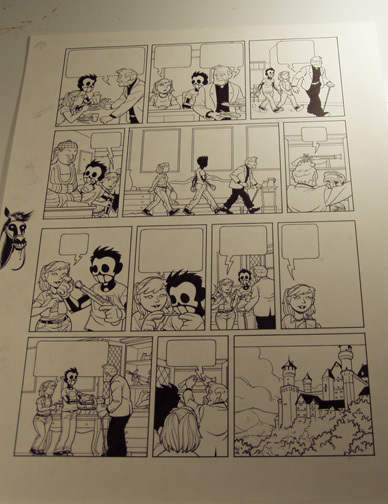 But I’ve gotten obsessive about having the original pages look completely finished, (I’ve even had a gallery show of them, so it’s not really as crazy as it sounds) so I usually pull out a brush and some ink and fill in the blacks. And that’s what the final, scanned page looks like! 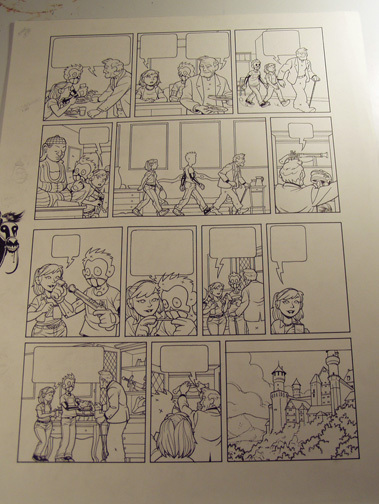 Since I’m working at such a large size and I only have a letter-sized scanner, I have to scan each tier in two parts. So, eight scans and some time rebuilding and I’m ready to color! That’s covered elsewhere.